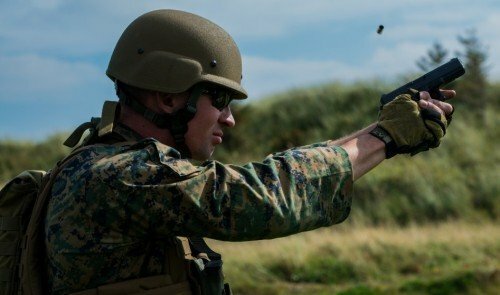 U.S. Marine Corps Special Operations Adds Glock 19! You are here: Home / Firearms / U.S. Marine Corps Special Operations Adds Glock 19! 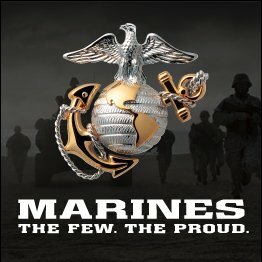 The U.S. Marines pride themselves in being “The Few, The Proud”. The United States Marine Corps Special Operations Command (MARSOC) has officially added the Glock 19 to the approved list of sidearms for Special Operations Marines according to the Marine Corps Times. This announcement comes on the heels of the U.S. Navy SEAL Teams switching to the Glock 19 as their official sidearm, after years of using the Sig Sauer Mk25 P226. 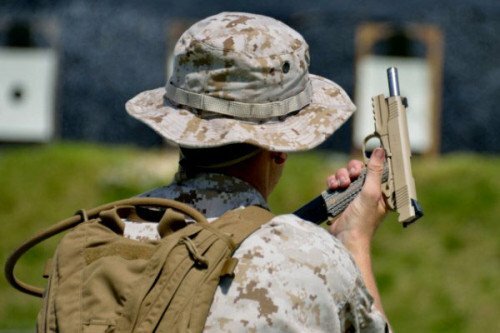 The Marines Special Operations moving towards the Glock 19 makes perfect tactical sense. The Marine Corps is a part of the Department of the Navy, and now special operators from the Navy and Marine Corps will have weapon interchangeability. When we wrote about the Navy SEAL change it generated a lot of interest, and comment. Though Sig Sauer makes outstanding firearms, and the Mk25 P226 has more than proven its worth, the Sig pistol weighs nearly double the Glock 19. The Sig Mk25 P226 is also a DA/SA hammer fired pistol that is larger than the Glock 19 striker fired pistol. The Glock has a consistent 5.5 lb. trigger pull while the Sig Sauer went from a 10.0 lb. DA trigger to a 4.4 lb. SA trigger. Glock’s are easier to maintain, and have proven themselves with militaries and police forces worldwide. The United States Marine Corps is 240 years old. The Marines have been some of America’s toughest fighters for 240 years, and Special Operations Marines are some of the best in the Corps. Since the mid 1980’s the Marine Corps, like the other service branches, issued the Beretta M9 pistol in 9mm to its Marines. The few hundred Special Operations Marines were allowed to carry 1911’s in .45 ACP. Those 1911’s were hand-built from old 1911’s by the Precision Weapons Section at Quantico. 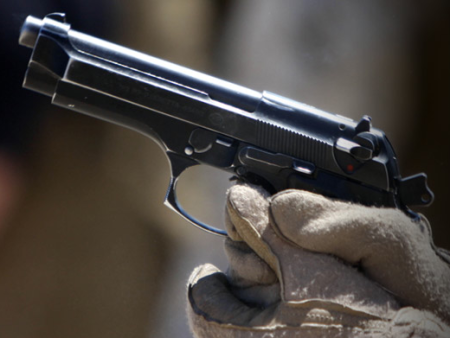 A U.S. Marine Beretta M9 pistol (photo by U.S. Marines). When the Marines officially created the MARSOC units in 2006 the need for 1911’s jumped from around 400 to over 4000. The Precision Weapons Section could not practically keep up producing 1911’s from old parts. Just a few years ago, in 2012, the Marines spend roughly $22.5 million on the project to develop the MARSOC 1911, according to Military.com. At the time there were many in the military that expressed concern over the aging Beretta M9, and in 9mm ammunition in general. The Model 1911 has been a proven battle pistol for over 100 years, and there was a significant push to go back to the iconic pistol in the larger .45 ACP. Through an extensive testing process the Marines chose the MARSOC 1911, which earned a designation of M45A1 Close Quarter Battle Pistol. When the MARSOC 1911 finally came to fruition there were many who believed the modernized 1911 was the answer the Marines had been looking for. Here a Marine Corps Special Operations Marine training with the MARSOC 1911 (photo by U.S. Marines). The new pistol had to perform at demanding levels, being capable of putting five-shot groups on target that “didn’t exceed four inches by four inches at 25 yards” from an unsupported firing position. However, fairly early on some military pistol experts found the 1911 design, while extremely accurate, requires more training and care than other modern tactical pistols. The same Military.com article reports a former Marine weapons instructor who trained MARSOC Marines found younger operators had trouble activating the 1911’s beavertail grip safety. Many of the Marines wearing gloves tended to grip the 1911 too high, which is actually a great training principle for recoil management, but when doing so they were not properly disengaging the beavertail grip safety, preventing the pistol from firing. The Glock 19 is considered a Compact pistol, being slightly smaller than the full-size Glock 17. However, it still maintains a 15+1 capacity. Unlike the MARSOC 1911, the Glock 19 has no external safeties other than the trigger safety bar. With a polymer frame, the Glock 19 is much lighter than the MARSOC 1911 (much like being lighter than the Sig Sauer Mk25 P226). The Glock polymer frame has proven to be incredibly durable to harsh conditions and exposure to chemicals. The polymer frame is also corrosion resistant, meeting the needs of maritime forces working around salt water. Sgt. Devin Hughes of the Marine Shooting Team firing a Glock 19 (photo by Marine Cpl. Cameron Storm). It is unclear why the pistols were only now approved for MARSOC, however it has been reported that some Marine Special Operations forces were already carrying Glock 19’s. Marine operators have sometimes carried the Beretta M9 or M9A1 pistols that general Marines carry, but more often carried the Corps’ M45A1 Close Quarter Battle Pistol in .45 ACP. Here Marine Spec Ops forces train with the MARSOC 1911. Army Special Forces units often use Glock pistols while training foreign police and military personnel. For example, the Iraqi government purchased more than 100,000 G19s to issue to their security forces. It was considered best practice for U.S. instructors to use the same firearm as their students, so Army Special Forces trained and carried the Glock 19. MARSOC has not yet determined which holster it will use with the G19. 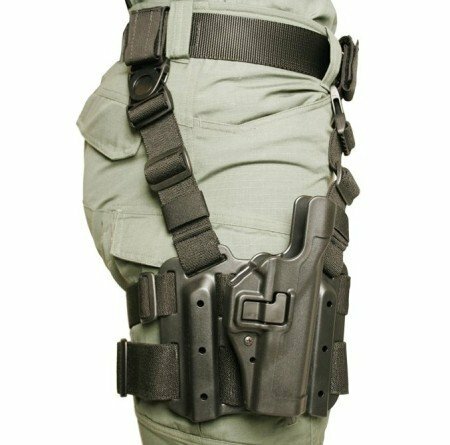 The Corps currently issues the SERPA Level 2 Tactical Holster for use with Beretta M9s, and that holster is available on the civilian market for the Glock 19 as well. It would make perfect sense to select that holster for the new Glock 19‘s as the Marines would already be familiar with the locking mechanisms and releases. The Blackhawk Serpa 2 Tactical Holster (photo by Blackhawk). Though the Blackhawk SERPA holster has received some criticism, there have been many testimonies by soldiers in the field touting the holsters durability and function in harsh conditions. There are also many law enforcement agencies that use SERPA holsters, and have found them to be durable and very good at weapon retention. At the same time officers have been able to draw their sidearm much quicker than with other retention holsters such as the venerable Safariland SSIII. The Glock pistols are proven performers. They have been in the hands of militaries, law enforcement, and civilians across the globe, and continue to have a high level of popularity. The Glock success can be found in a firearm that is remarkably simple to work on and maintain, is much lighter than comparative all-metal pistols, and just keeps on shooting. Their durability and accuracy are well documented. When the Marine Corps chose to develop the MARSOC 1911 there was a lot of history and bullet performance behind the move. Military shooters are still limited to ball, or FMJ bullets due to Hague Convention restrictions. This does present a significant concern that 9mm might not be enough to do the job. Though the 9mm cartridge has made remarkable gains in performance in the last decade, those improvements have by far been realized on the self-defense ammunition side. The .45 ACP has a proven track record and provides a larger mass to strike and hopefully incapacitate an enemy. However, when the MARSOC 1911 was issued, it was found that the newer Marine Special Operators were just not keen to the system. The 1911 has half the capacity of the Glock 19, weighs more, and has external safeties that apparently were problematic for these newer Marine shooters. 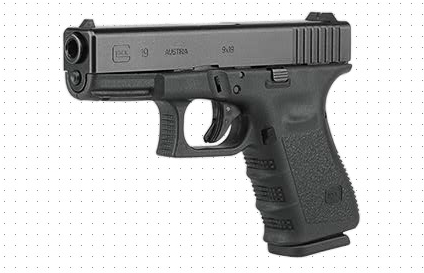 The simplistic Glock design is a point-and-shoot model that has been proven to be dependable. We think this move is a good move for the Marine Corps, especially since their Navy brethren have already switched to the Glock 19. Two things about this bother me. One, they will be using ball ammunition, there has been no performance improvement in ball ammo in over 100 years. A 0.45″ hole is still larger than a 0.355″ hole, and will allow more blood to flow out. 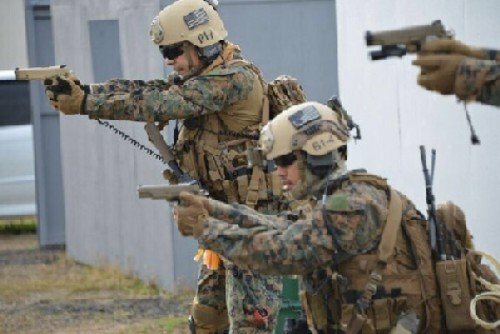 Two, “when the MARSOC 1911 was issued, it was found that the newer Marine Special Operators were just not keen to the system.” Train to the standard, don’t lower the standard to accommodate the troops. I agree with you David on the caliber issue, but I do see a benefit of the Glock over the 1911. In a high stress situation Glock is a true “point and shoot” firearm, with nearly twice the capacity of the 1911. Now, as far as the ball ammunition … I have seen some U.S. Military documents involving the testing of hollow-point ammunition. I know Geneva Convention restrictions are still in place, but I’m beginning to wonder if the military is going to start viewing actions against terrorists as separate from military vs. military actions covered under Geneva. We’ll see. If that is the case the advances in ammunition designs could make the 9mm more viable for Marine Special Operations. I’ve heard similar rumors regarding the possible use of hollow points in the war on terror. I’m interested to see how that goes. True the Glock has a larger capacity for ammo and it is basically point and shoot. I believe that the 1911 is also a point and shoot weapon with proper training. My drawstroke includes sweeping off the thumb safety and my thumb rests on it. However as I learned in the Army the military likes to skimp on training. I personally like the 1911, and have enjoyed shooting one when I’ve had the chance. However, the Glock adds capacity, reduces overall weight, and like you said is very much a point and shoot handgun. Though releasing the safety lever can be trained, like you said – the military often skimps on training until we’re knee deep in it. Stress in combat, and leftover peacetime protocols could result in disaster during close combat situations. The Glock allows a draw, point, shoot without a fine motor skill (safety lever release) in between. Good stuff, and thanks for reading David! One its not the Geneva Convention that bans the use of hollow point ammo. It’s the Hague Convention the “Dum Dum” Clause to be exact. Two the USA never ratified the Hague Treaty the Military chose to abide by the treaty but reserved the right to disregard is as they saw fit some SOF units use JHP for certain applications. Three even is the USA ratified the treaty it only applies to wars between signatories of the treaty. Its one of the biggest misconceptions going around now even within the military. Right you are Tony, thanks for the catch! It’s been corrected. And great information on the other misperceptions, thanks for your input.